This article extends the article CSizingControlBar - a resizable control bar by Cristi Posea. Webmaster's note: the CSizingControlBar class used in this code is an earlier version; follow the link above for the latest one. The Control bar like in DevStudio, which has Tab Controls with different Views (like TreeViews) and it can be docked and resized. Create the bar in CMainFrame::OnCreate(). Then set bar styles, enable it to dock... like any control bar. Be sure to add IDW_PROP_BAR to the "resource.h" and to add the bitmap IDB_TABIMAGES to your resources. Thats the only thing you have to do, to add a view! 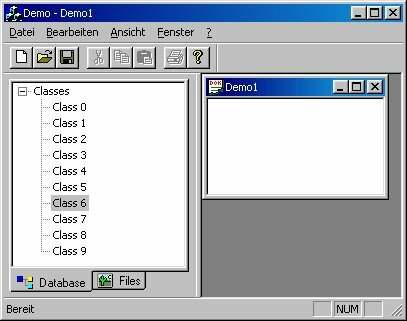 Note: use the base framewnd class member function, ie if you have an SDI application replace CMDIFrameWnd with CFrameWnd below.